Indoors under fluorescent or incandescent light it has almost no color at all (picture 1) but in daylight it has an attractive "'uranyl" yellow-green color (picture 2) similar to, but not as intense as the strong color it shows under Short-Wave UV (picture 3). I have heard of similar material from Erongo? but not seen it. The best pieces of this material is completely transparent with smooth botryoidal surfaces and small free-standing druplets. That is remarkable considering that the vast majority of fluorescence is so low level as to be totally undetectable in daylight. A very interesting piece Pete. Would you care to share the name/location of the dealer? I'd like to see that in person. My husband says that without analysis, there may be enough ultraviolet radiation in sunlight to cause the mineral to fluoresce. 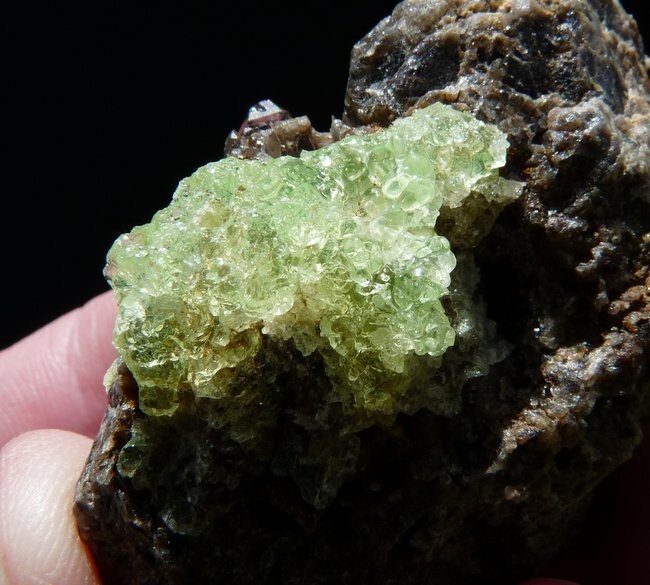 A similar effect can be seen in some of the green fluorites from England (particularly the green ones from the Heights mine). 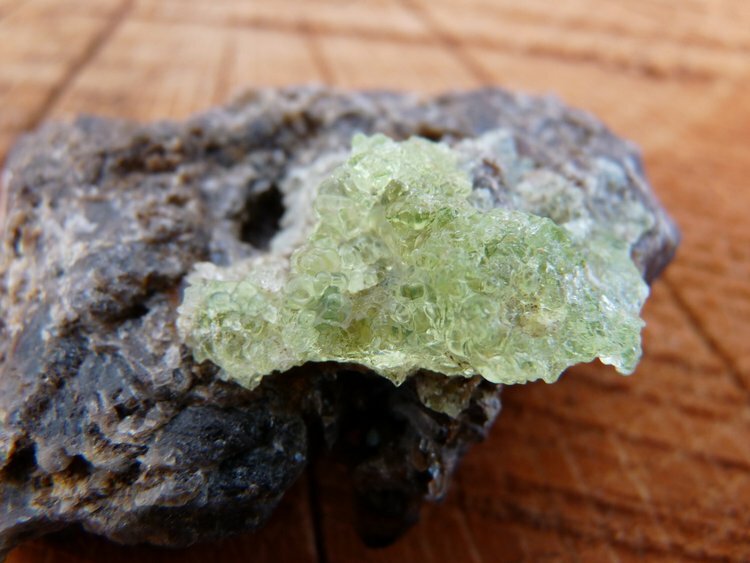 In the case of hyalite opal, the activator is thought to be the uranyl ion. 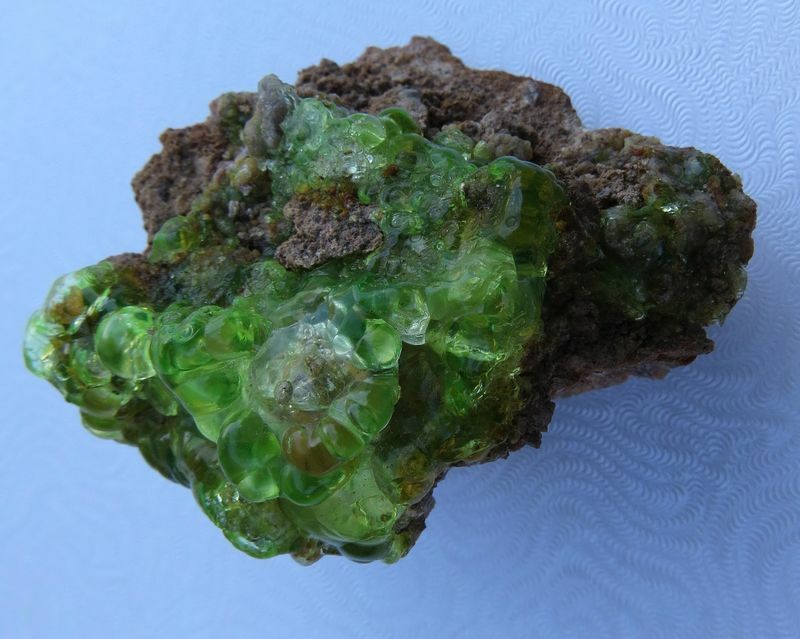 A similar phenomenom is seen in "green transmitter" (aka "chartreuse") diamonds, which show intense green luminescence under visible excitation (thus green emitter would be a better terminology for such diamonds), so that they look yellowish green or greenish yellow under fluorescent light (that includes daylight), while they will look yellowish brown under incandescent light. Here is a specimen from Erongo, Namibia. The photos where also taken in sunlight. I thought that the green colour was due to some mineral. Please help me right. 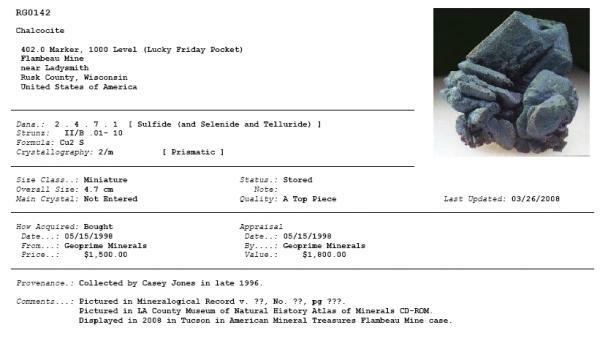 Pierre, several people mentioned the Erongo material to me during Tucson...thanks for posting pictures. 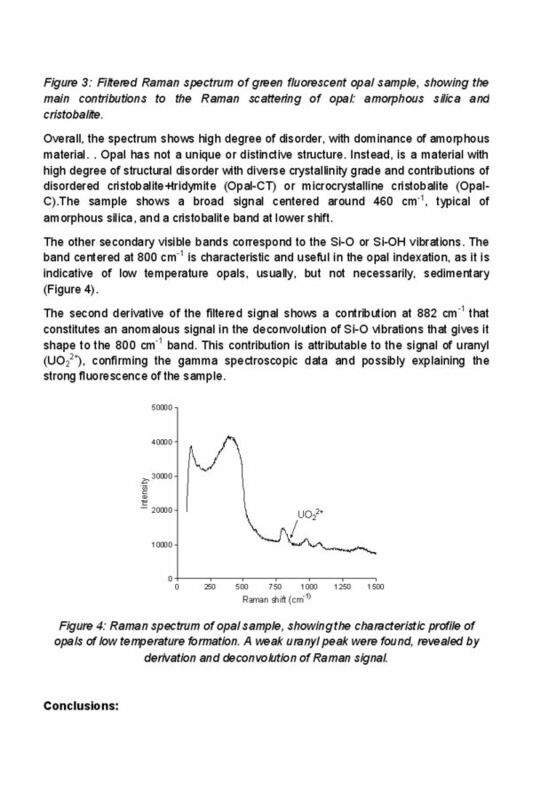 Is the fluorescence strongest in direct sunlight or indirect? The Mexican material seems to wash out in direct sunlight, with the strongest response in shade or "filtered" sunlight. Glass clearly dampens the effect. Having obtained more material since my initial post, I can make more observations. 1. There is a range of daylight response from almost none to a pale yellow to the intense yellow-green shown here. 3. SWUV response is much greener in the daylight fluorescing material. The less responsive material gives off a yellower fluorescence under SWUV. 4. LWUV response is also strong, but I don't have a good LW light so I can't make systematic observations. 5. 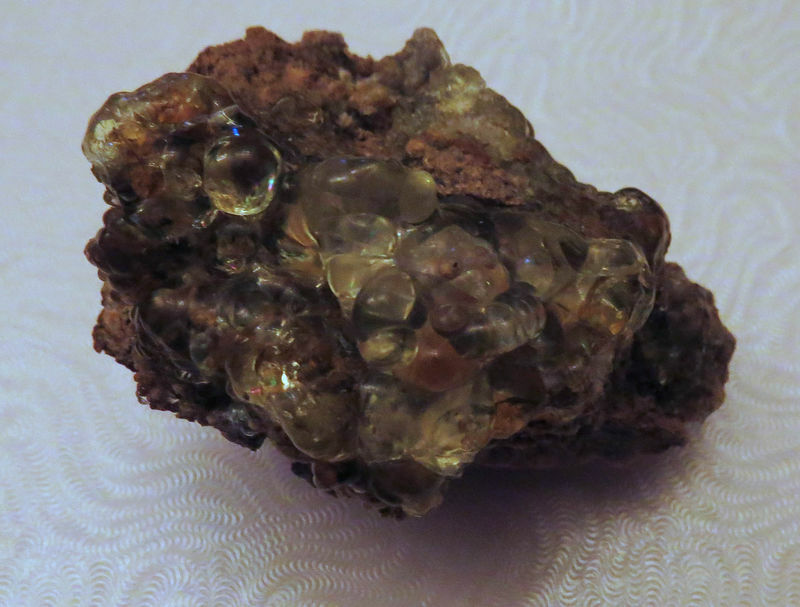 A few pieces have opal grown over sprays of yellow acicular crystals that look like sklowdowskite. In one instance the opal overgrows individual fibers giving an effect that looks like a sea anemone. Let me encourage anyone in possession of one, and of a gem spectroscope and a not too cloudy sky, to aim the second at the first under the third! The UO2 group produces a very characteristic response, with three narrow emission bands side by side in the green, flanked by two weaker ones, one on the yellow side and one on the blue-green side, like the fingers of a hand. 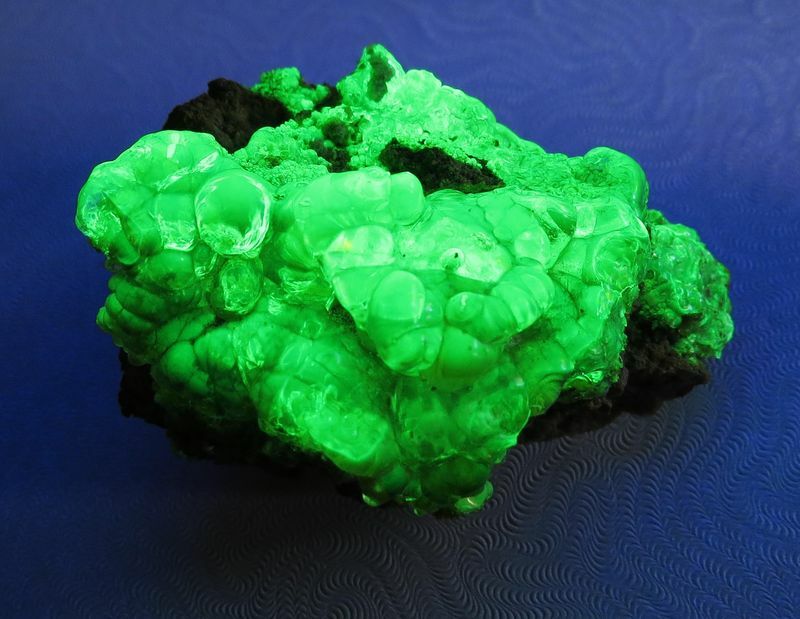 The spectrum looks very different from other bright-green fluorescent minerals such as Franklin Willemite or MSH Genthelvite, whose response comes in a single wide green band. This is what I would expect when the concentration of activator sites is high enough to absorb (and convert) all the incoming UV already very close to the surface. Pierre, several people mentioned the Erongo material to me during Tucson...thanks for posting pictures. Is the fluorescence strongest in direct sunlight or indirect? Hi Peter. I am still not sure whether it fluoresces or whether it is coloured green by some or other mineral. I find it strange that the real colour is a beautiful green 'jelly' colour but on photos the colour appears more pale green. Here follows 2 more photos; one taken outside with cloud covering and one inside, with daylight (overcast) coming through the window. Compare these photos with the original ones taken in sunlight. 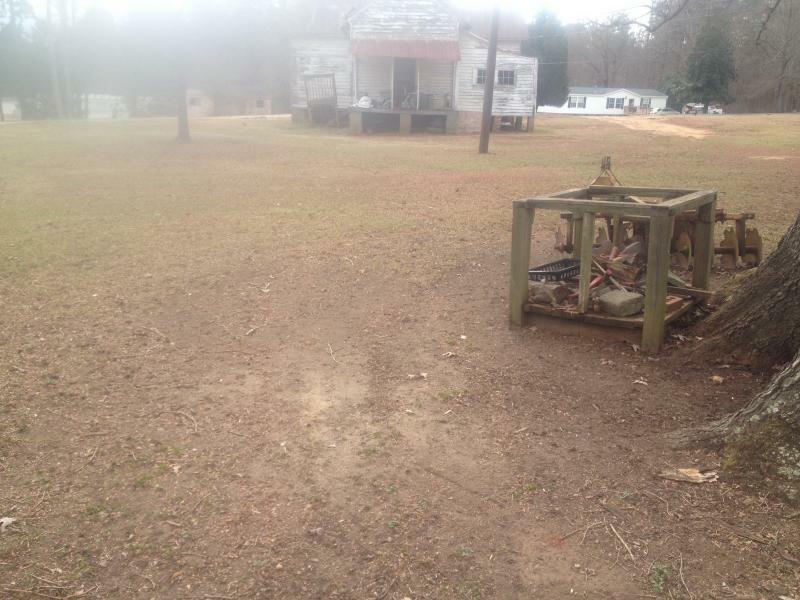 This photo was taken under an overcast sky. This photo was taken inside, with light coming in through the window. (overcast sky) The real colour is darker and more uniform than this. 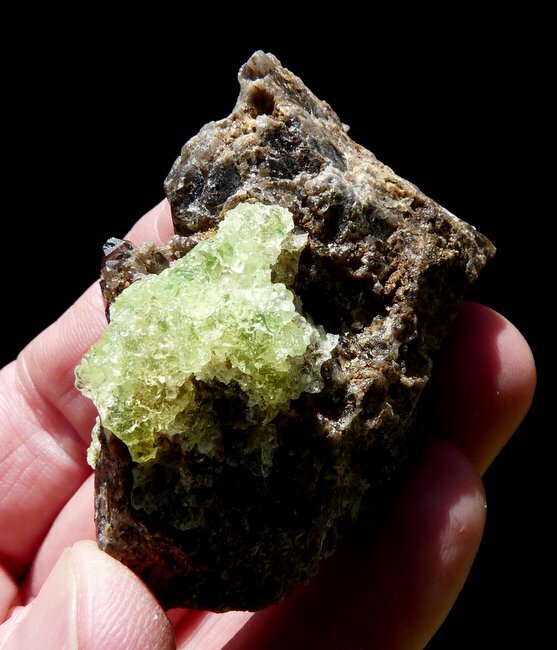 "Daylight fluorescence" is a more widespread phenomenon than mineral collectors realize, but is usually overlooked. Several minerals fluoresce when exposed to the shorter wavelengths of visible light (blue and violet). The best way to observe it is to look at minerals illuminated exclusively with blue light, no other wavelengths of illumination being present. 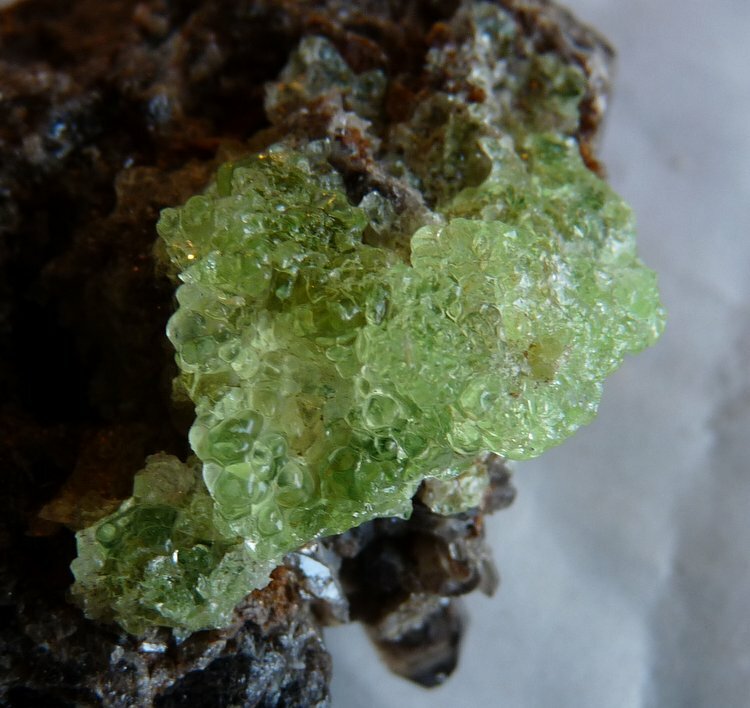 Then if your mineral glows in green, yellow or red, you are observing fluorescence and not just reflection of daylight. A century ago someone tried this by blacking out the windows in a room, leaving only one small open spot for a beam of sunlight to enter, which was then filtered through a glass jar of copper sulphate solution. Nowadays it is easier (but more dangerous) to just use a blue laser at night. 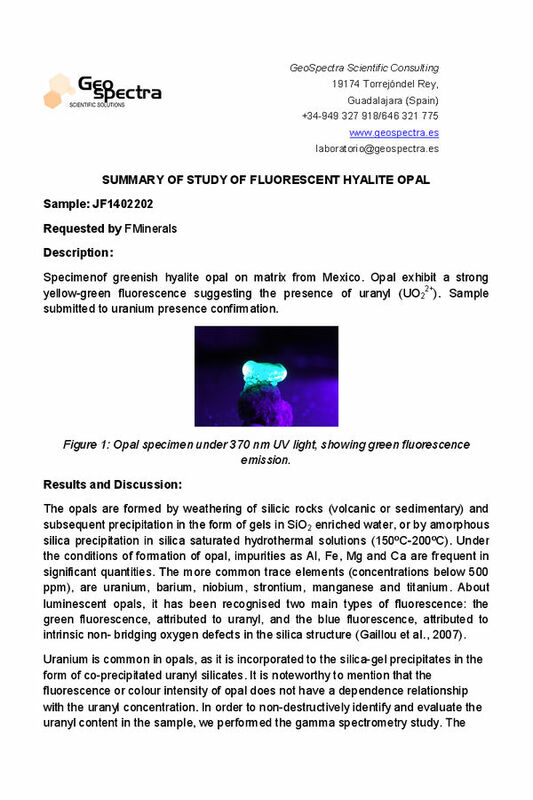 You will find several yellow secondary uranium minerals fluoresce under blue light, some diamonds, rubies, red spinel, calcites, organic minerals.... and probably more that no one has thought to try yet. César Menor Salván is a former researcher from the main Spanish scientific research center (CSIC) and we are enough lucky in Spain to have him as an analyzer through his company GeoSpectra. You can check APXS: from Mars to the mineral collector's workbench - (17) to know more about the analytic methods he is using. 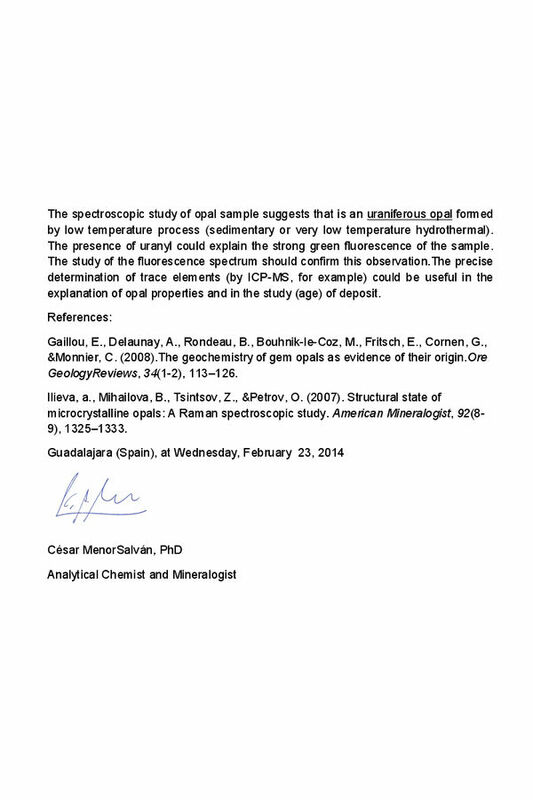 Of course I submitted to him one of these fascinating new Mexican Opals and here you have a result of his studies. Interesting, right? This is very interesting information. Thank you for the analysis. To put the quantitative results in perspective: What was the size of the sample, not counting the matrix? And what are the y-axis units on the gamma spectrogram - "Counts", but accumulated over what length of time? Thank you Jordi for the analysis. This will be a nice compliment to the owners of those samples. Thank you, Jordi, for the reference and friendship. Gerhard, take into account that this is a summary. My policy is that all data and technical details belong to the owner of the samples :). 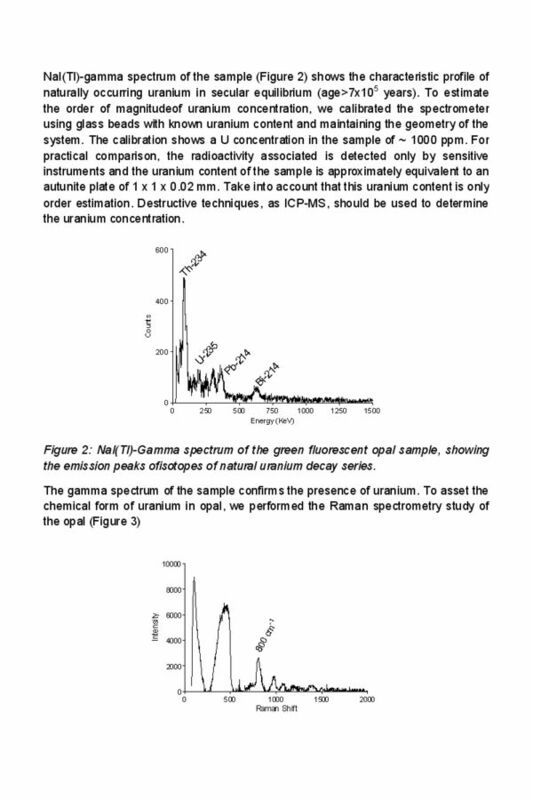 In this case, the sample weight is 2,53 g and the gamma spectrum accumulates during 4 hours, measured without matrix, in a background isolated "lead castle". In spectrometry, the geometry of the system is a critical factor anyway. But, anyway, as you can see, the radioactivity is very low. I'll soon have a chance to look at the luminescent response through my spectroscope, and will report on what I see. Unfortunately I have no way of capturing this photographically. I've played around a bit more with my LED flashlight and found that the yellow and green patches move when I move the light source: so they don't arise from different material properties at all. Rather, the opal blobs act as little lenses, focusing the incoming light onto a few bright spots on the rear side where they contact the matrix - and these spots move as the angle of illumination changes. And then the blobs again act as loupes, showing magnified versions of the bright spots to the observer's eyes. They now appear yellow because the violet component of the incoming light has already been absorbed and turned into green fluorescence. Those bits of opal through which I'm not looking at such a bright spot appear green rather than yellow. Along the way, I also learned that this particular LED flashlight emits practically no blue light… it contrives somehow to produce a continuous spectrum from red through yellow to green, then there's a gap, and then there's a violet band centered around 450-460nm; the whole arranged to fool a human eye into seeing white when there's no spectroscope in the light path.